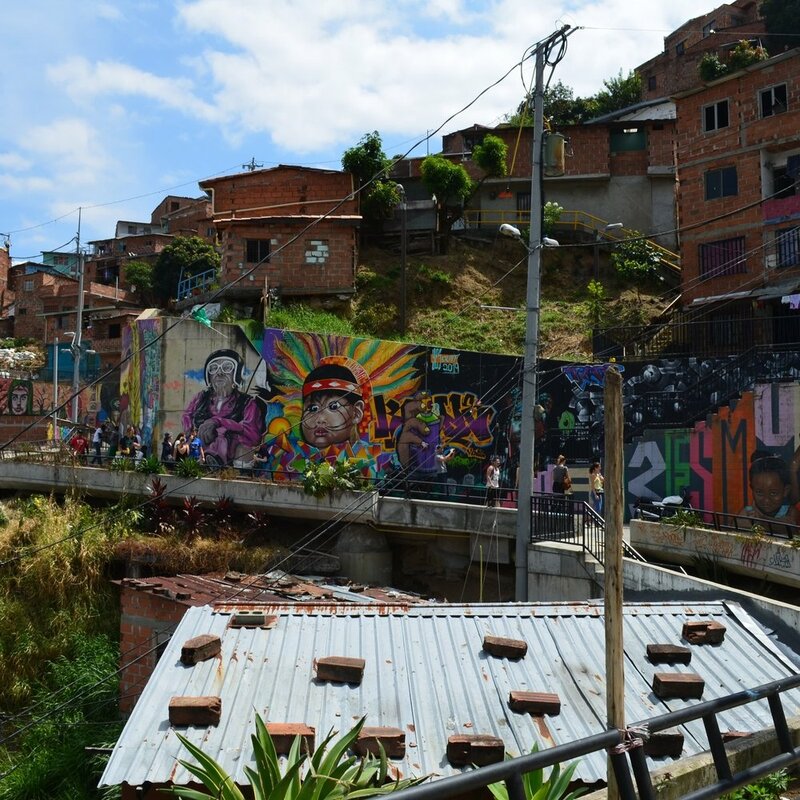 The story was shared with me while I was under the intense sun near the top of Comuna 13, the second largest commune in Medellín. 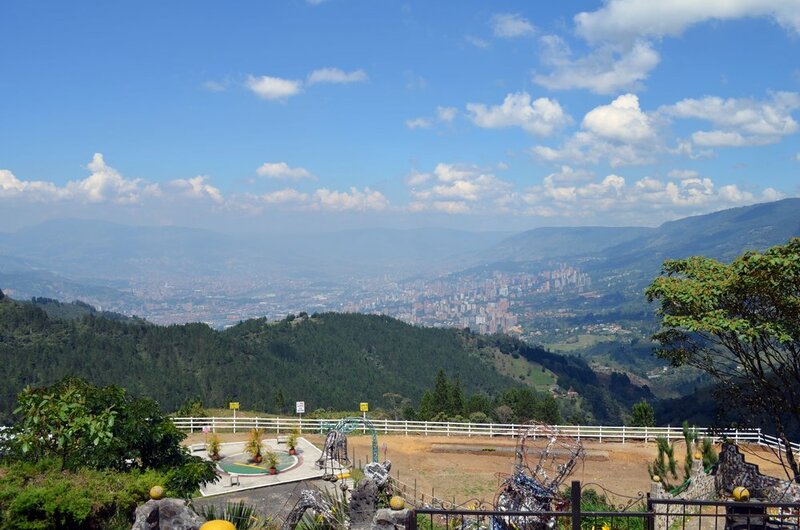 Our guides, Ciro and Sebastian, stood in front of our group, all of Medellín a backdrop behind them. We had climbed our way to the top of a steep barrio, with three armed police and three bright orange slides directly below us. 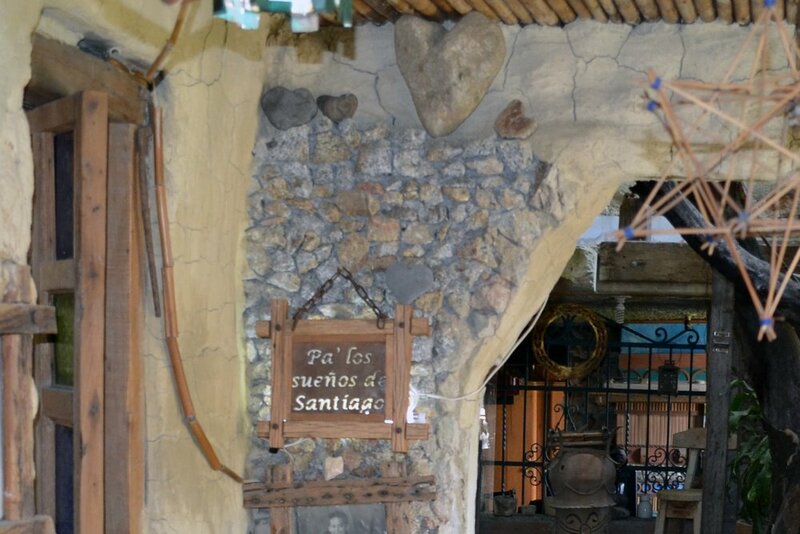 The story was about the birth and evolution of Comuna 13. 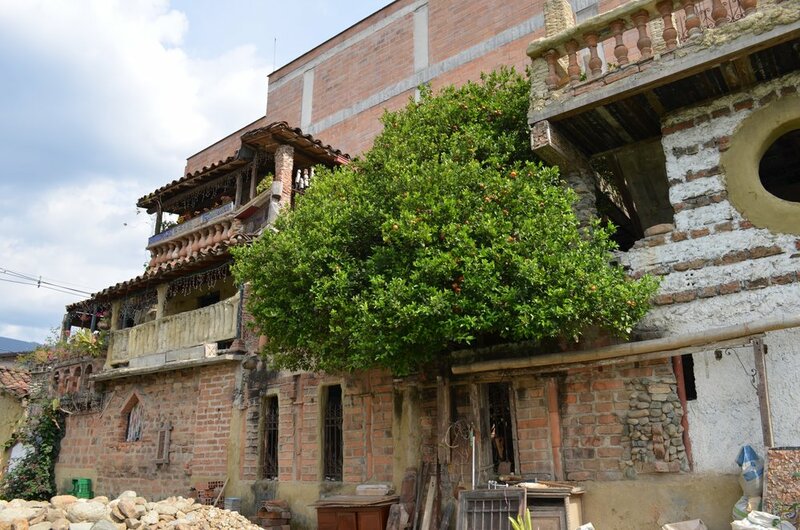 I’ll share it as it was told to me: in the 1950s and 60s, guerrilla violence was uprooting masses from their mountain towns around Colombia. In the 70s and 80s, it was narcos. 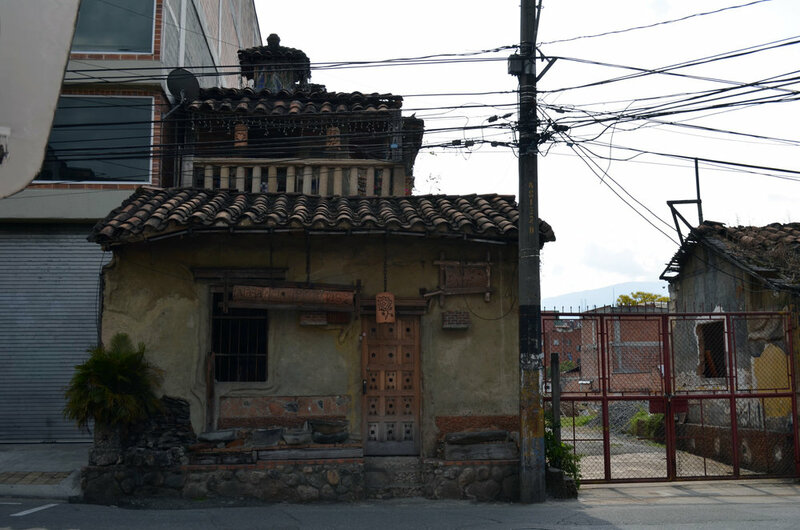 Many of the displaced made their way to Medellín through these decades, and re-established on the steep outskirts of the city, building shelter with what they could find. The government didn’t fully recognize them until the late 1980s. 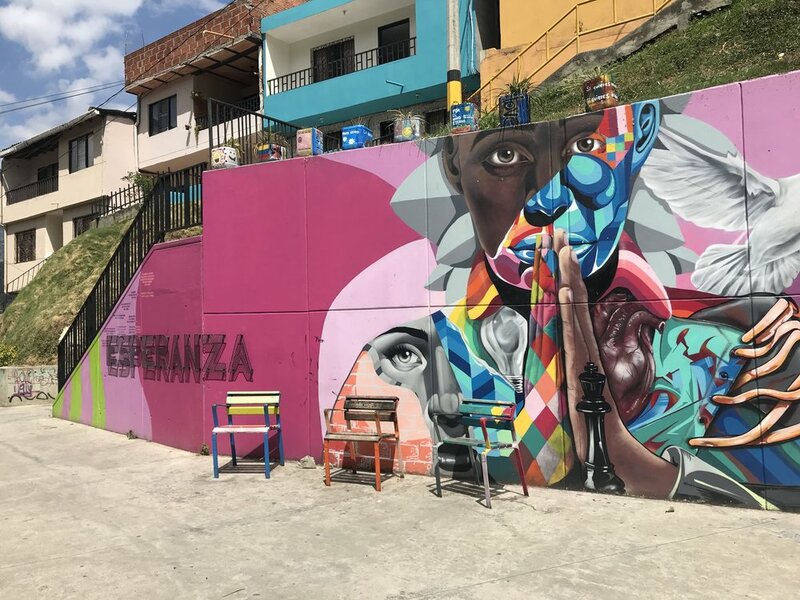 By the early 2000s, violence caught back up with the community when Operation Orion left hundreds of Comuna 13 residents dead and missing, the result of a government operation to rid the city of urban guerrillas. 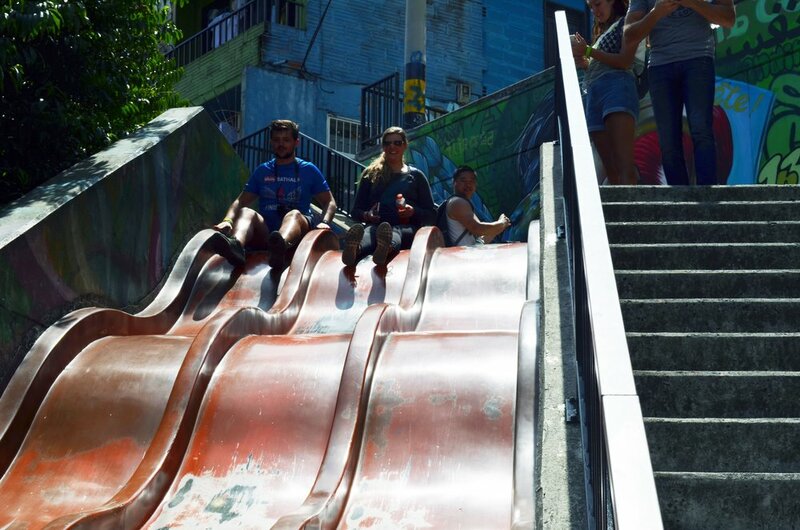 The slides, we learned after meeting back up at the bottom of them, were part of a playground built in memory of Sergio Cespedes, a child killed in Comuna 13 by a stray bullet in a gunfight. Another somber story, but to the residents of the area, the park is a reminder of childhood innocence. According to Ciro, it specifically represents three main values: enjoying the little things in life, choosing happiness first, and being able to forgive. 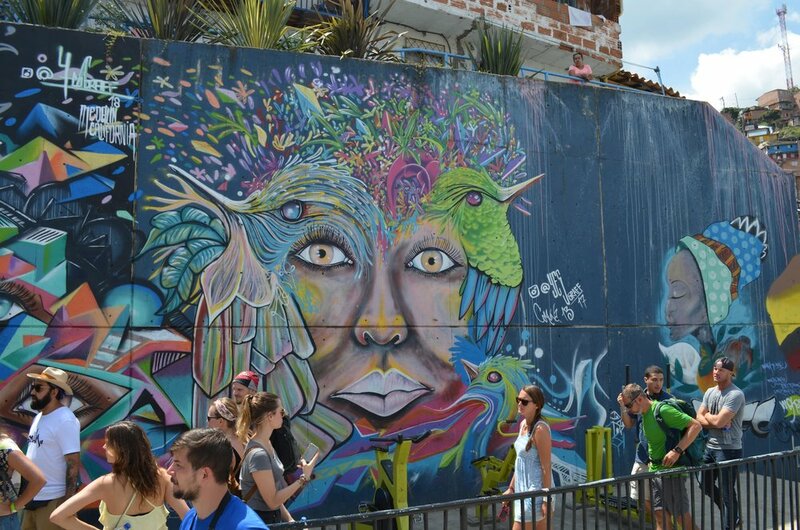 As we made our way back down the steep colorful streets to check out the murals (meeting a few of their talented owners along the way), our guides gave us a brighter story that perfectly matched the scenery. 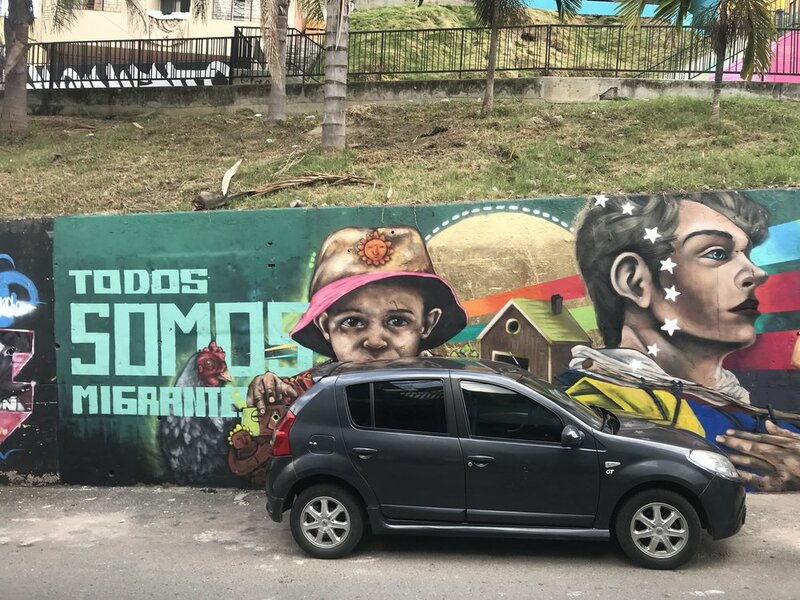 After Orion, the youth of Comuna 13 decided to fight back peacefully. Hip hop culture (graffiti, rap, dj, and dance) was their weapon of choice. There is a deep symbolism behind each piece of art here. Eyes, as windows to the soul, are often a focus. Their prominence in current works also represents that there is no need to hide. 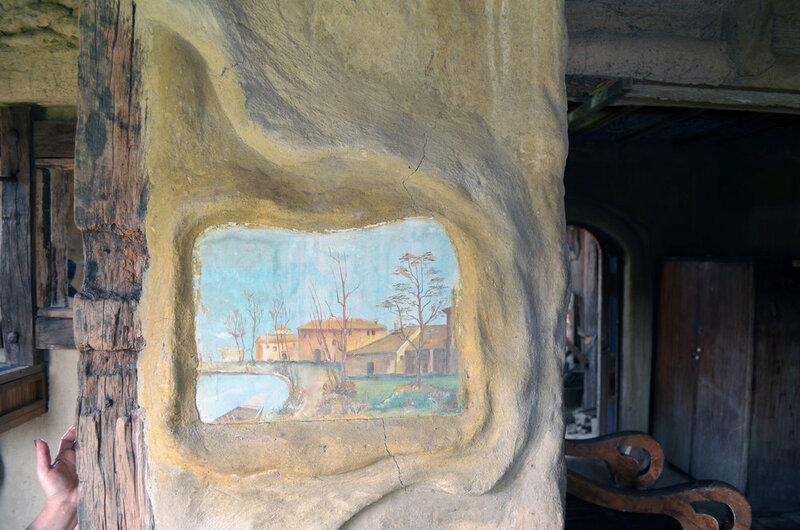 These local artists are often hired to create their pieces. 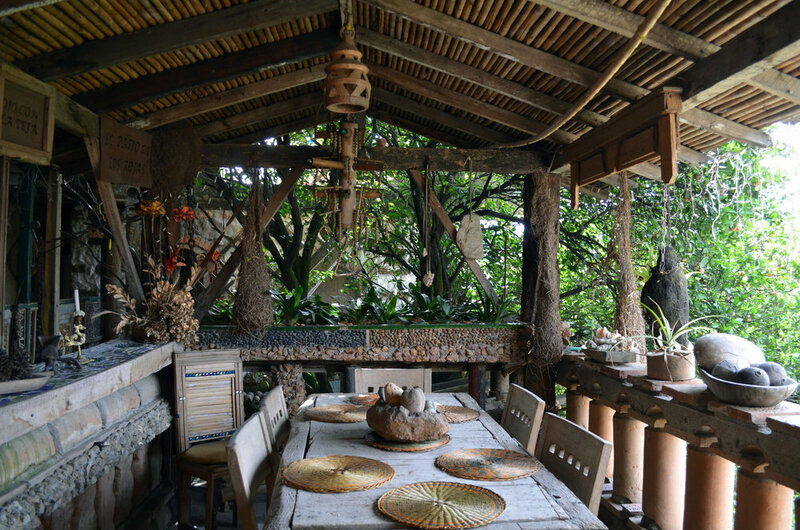 Their works brighten public spaces, streets, stairs, sidewalks, and private residences. 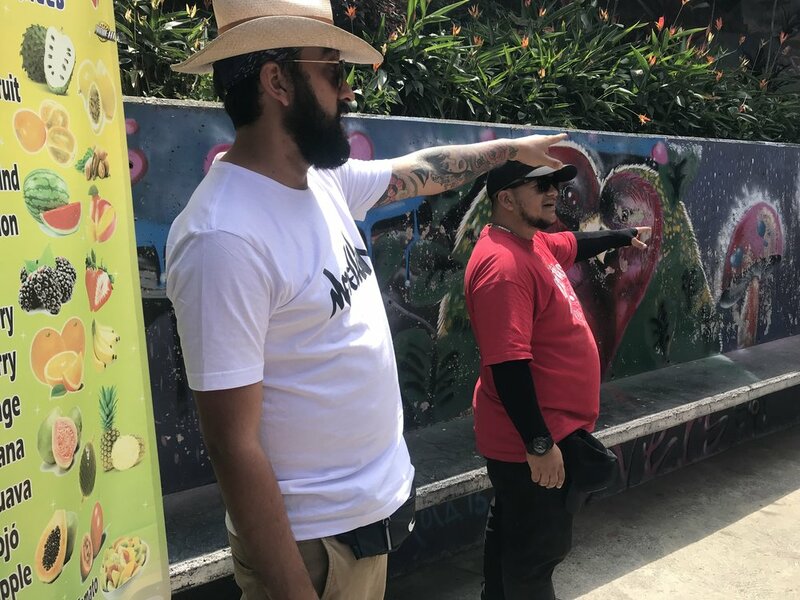 The tour through Comuna 13 was a lesson in being a good citizen of the world, with Ciro using the art to pose a series of questions that pondered the more important things of life. Do we know who we are? What are our roots? What can we learn, who can we become? What difference can we make in the world? What can we give back to the earth? Pachamama was a boldly and beautifully recurring them. As was hope. 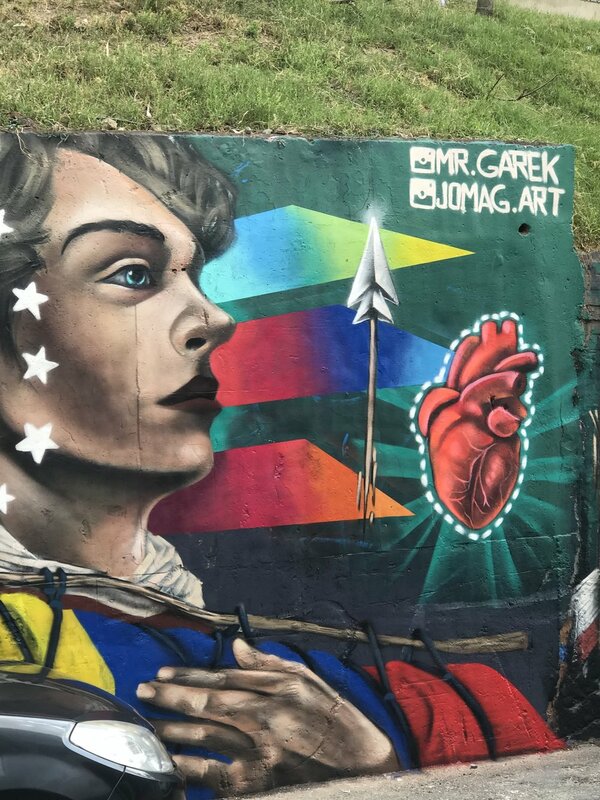 One of the last murals we stopped at was the esperanza mural, and I couldn’t keep up with it’s deep structure of symbolism- the red brick that is Medellín’s facade v the vibrance of Comuna 13 in a show of color blocks. The support of women- who worked to hold the community together through violence. The bright light of ideas and inspiration, the feelings of an exposed heart. The chess game that is war v the dove of peace. The most recent mural– one day old on our visit– was ‘todos somos migrantes.’ We are all immigrants. We all have roamed, we all belong everywhere, and we are all responsible for our world and each other. When this hip hop renaissance took hold near the start of the century, kids would often approach the artists as they worked, seeking safe community and a desire to learn the skill. 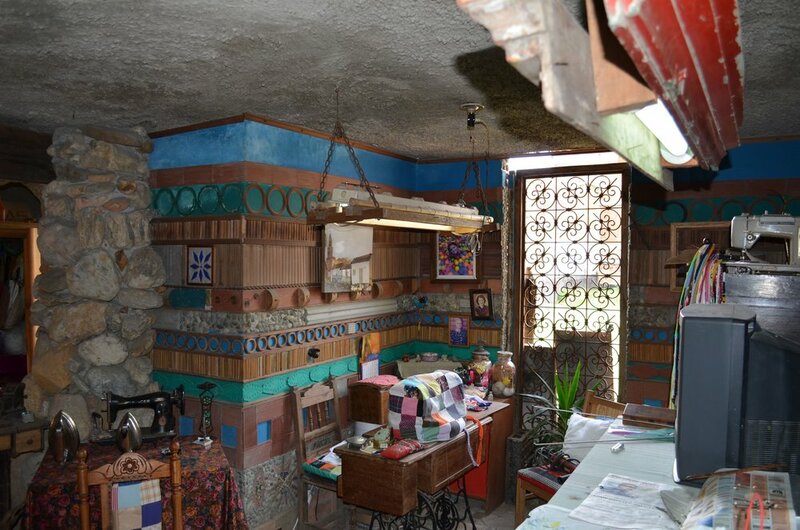 From these connections, Casa Kolacho– the ultimate in art therapy– was organically born. 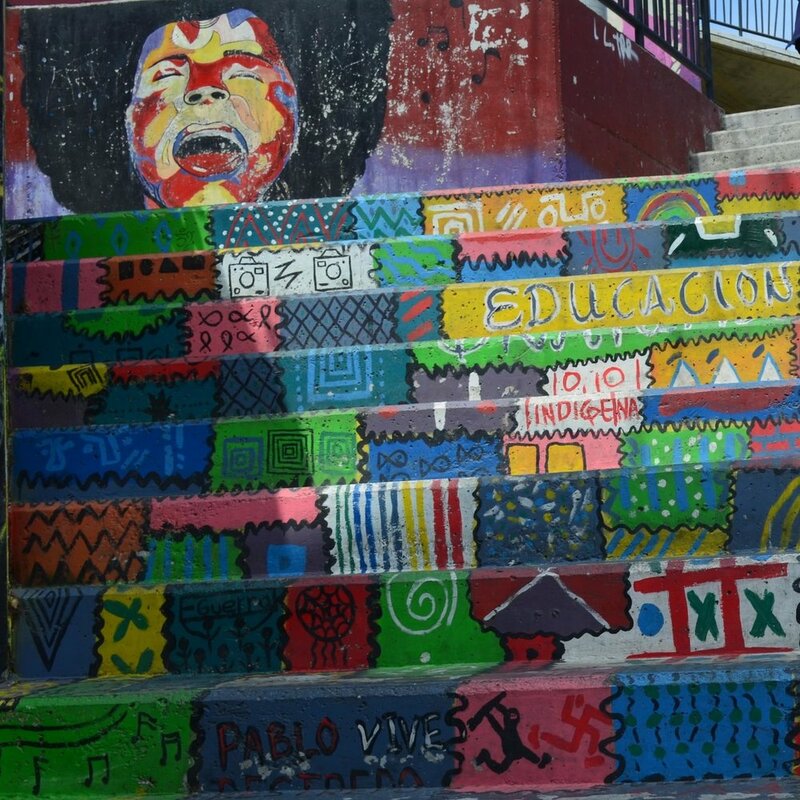 The program has been a haven for the community in Comuna 13 to engage in all aspects of hip hop. 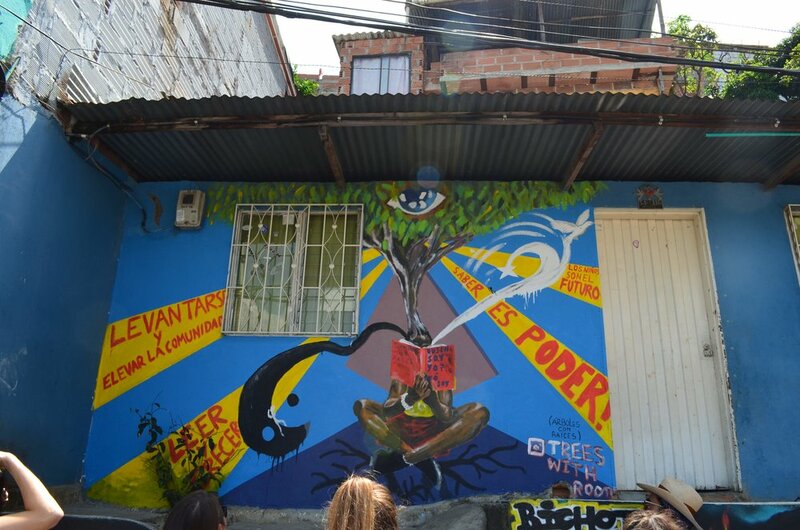 As part of our tour, we got to experience a performance from some breakdancers in the community, and see the space that houses Casa Kolacho’s educational center. Outside the center, we were taught proper technique and given a can of white spray paint and a clean slate to create our own tag. 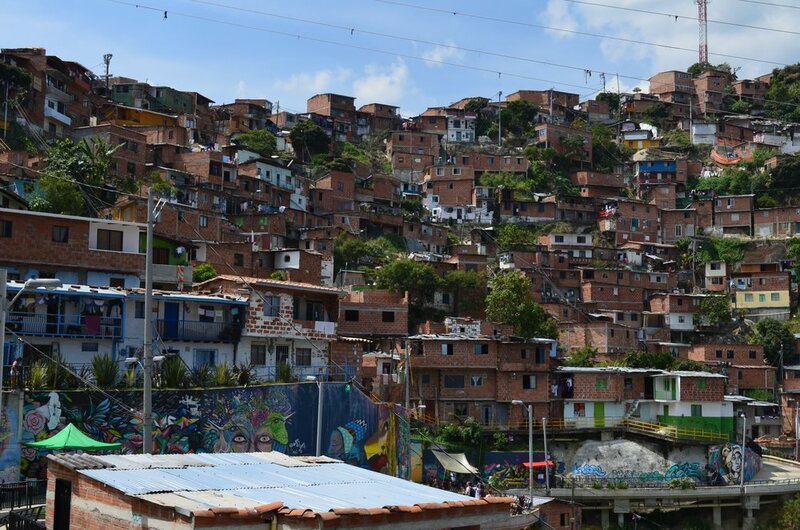 Our tour of Comuna 13 lasted around five hours. I left the zone with a big sunburn and an even bigger respect for this community. What they have achieved through art is inspiring. 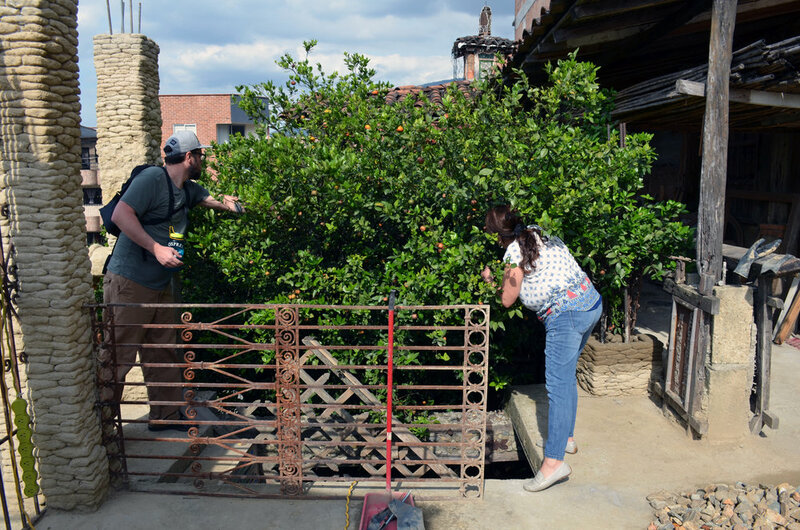 Here, I’m sharing maybe a quarter of what we learned from Casa Kolacho, because I believe their story needs to be spread as far as possible. But if you have the means, their story truly needs to be experienced in person. 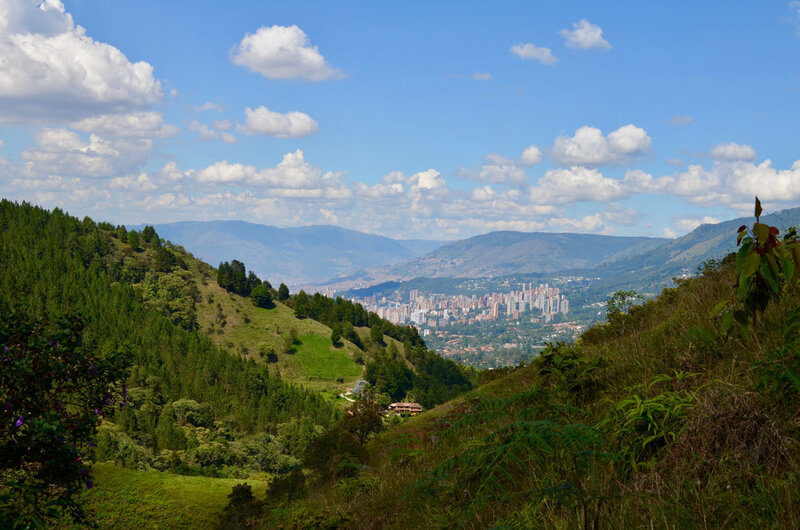 There are many tour outfitters offering trips to Comuna 13 in Medellín; please choose to support one that also directly benefits Casa Kolacho.